La Pequeña Habana ‘Little Havana” got its name from the hundreds of thousands of Cubans who fled their homeland between the late 1950s and early 1970s and settled in what originally was a lower-middle-class Southern and Jewish neighborhood. By the early 1970s, the Cubans had changed the landscape. The aroma of just-brewed cafecito was everywhere. Celia Cruz and Olga Guillot blared from record shops, and restaurant standards included pan con bsitec and steaming bowls of black beans. Subsequent waves of immigration in the early 1980’s expanded the cultural landscape of the area. The neighborhood, first reinvigorated by Cuban exiles, has now been settled by Latin American immigrants from all over. 4/21/1994, Al diaz/Miami Herald Staff --Francisco Lopez, manager, with various statues of saints. Varieties have changed due to people's different nationalities now living in Little Havana. 3/26/1984, Bill Frakes/Miami Herald Staff --Domino Park on SW 8th Street. Undated, Albert Coya/Miami Herald Staff -- 8th St. SW looking East from 27 Ave.
5/22/1994, Al Diaz/Miami Herald Staff: Fashion at Versailles -- waitress Elena Perez serves Norma Zuniga and Barbie Jimenez, right. 1/9/1988, Al Diaz/Miami Herald Staff: Fashion at Versailles; Maria del Pilar Barquin. 8/25/1984, Pete Cross/Miami Herald Staff: Teresita Esperon at Versailles Restaurant. 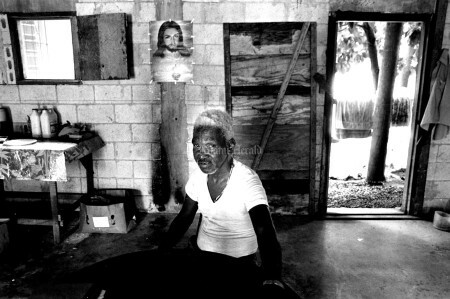 5/2/1994, Nuri Vallbona/Miami Herald Staff --Augusto GAlloso, 80, sits in his room as an inspector checks out the home which has been converted into an illegal rooming house. Inspectors found deteriorating ceilings, holes in walls and substandard living conditions at thisresidence on S.W. 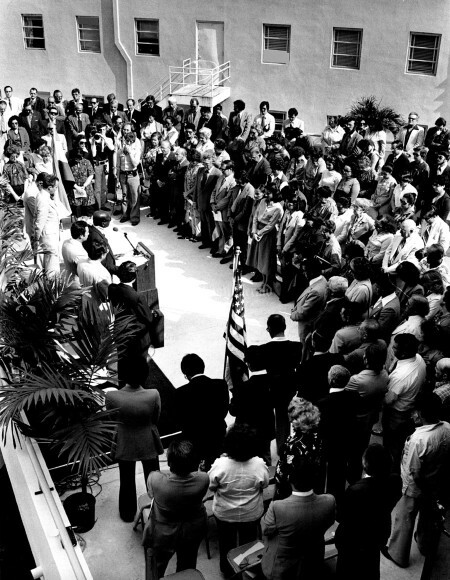 4th St.
Undated, C.W.Griffin/Miami Herald Staff --Members of the Little Havana Activities Center applaud after the playing of the national anthems of both the U.S. and Cuba just prior to the start of a program celebrating a Cuban holiday. 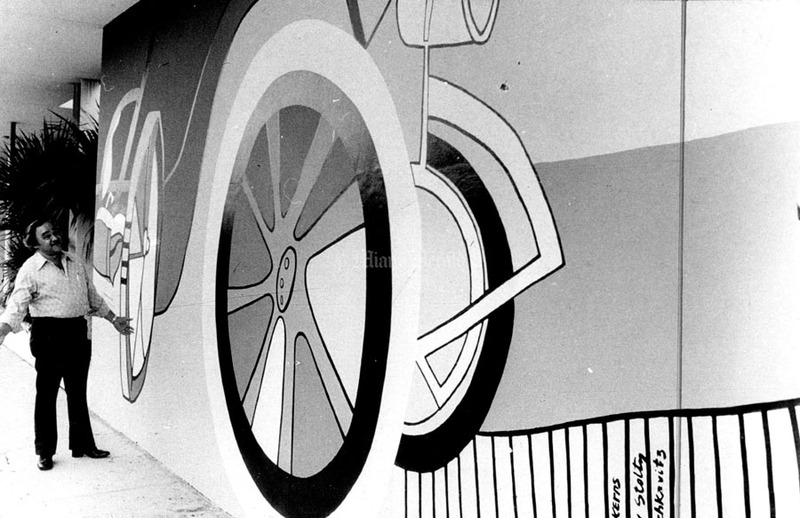 Undated, Bill Frakes/Miami Herald Staff -- House under I095 in East Little Havana. José lives with one other Mariel refugee in the house. 1982, Albert Coya/Miami Herald Staff --Twilight at 8th St. SW and 15 Ave. The Tower Theater was playing Death Wish II. 12/22/1993, Carl Juste/Miami herald Staff --Thousands of people were in line waiting for the Latin Chamber of Commmerce holiday food distribution in Little Havana. Many local politicians, community leaders, and volunteers participated in the Holiday giveaway to help the needy. 9/29/1977, Battle Vaughan/Miami Herald Staff --Little Havana looking Northeast from 27 Ave and 8 St.
6/29/1973, Dave Didio/Miami Herald Staff: This is the new skyline is el barrio -- shot of SW 4th st. looking west from 7th Ave. - south side of street -- most of the buildings have been built since April of last year. 5/2/1994, Nuri Vallbona/Miami Herald Staff: One of the houses suspected in being an illegal rooming house sits in Little Havana where old houses are routinely made into mini apartment complexes with substandard living conditions. Undated, Al Diaz/Miami Herald Staff: Little Havana - 18th ave Sw 11th st.
Undated, Al Diaz/Miami Herald Staff: Little Havana- 18th ave Sw 11th st.
1/26/1986, Rick McCawley/Miami Herald Staff: Gary Franckewich hammers new wood on to roof of house at 438 NW 1St. Preservationists plan to convert to Bed and Breakfast Hotels. 9/2/1986, Mary Lou Foy/Miami Herald Staff: Where Little Havana meets Coral Gables. 11/1/1990, Raul Rubiera/Miami Herald Staff: In the 1910's these houses were built on the Westmorland section of town, 13th Ave.
4/27/1991, Brian Smith/Miami Herald Staff: One of the best architectural gems in Little Havana is this home at 1801 SW 11th Street. 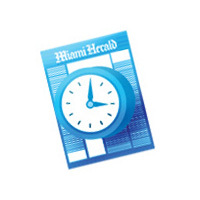 11/15/1990, Dezso Szuri/Miami Herald Staff: Welcome to Little Havana, USA. 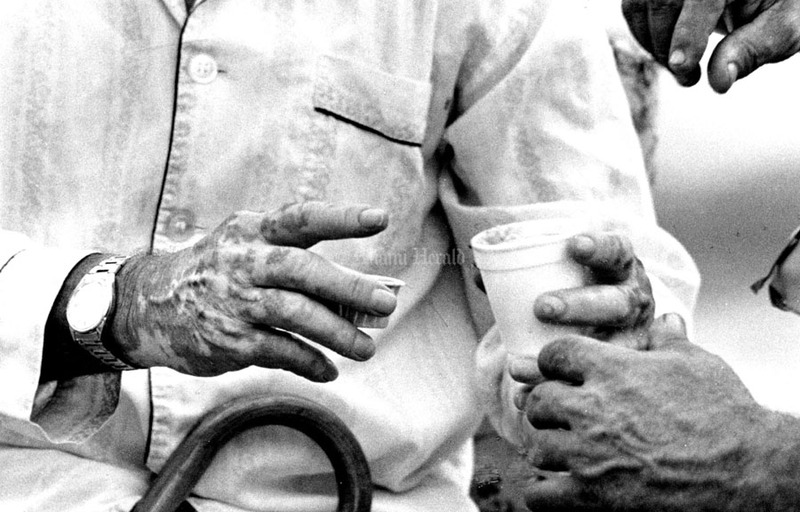 6/3/1991, Peter Portilla/Miami Herald Staff: Raul Fonseca, Vianda stand owner peels oranges in a Little Havana neighborhood where he parks his truck for the day's business, which delfin Tamayo, his employee, bags the peeled oranges. Client Victor Serra waits for the oranges he picked out to be peeled and bagged. Business is good for Fonseca, who's clients trickle in at a steady flow throughout the day. 11/17/1989, Albert Coya/Miami Herald Staff: Roberto Conde, Jesus Rivero - Gattorno, Pascual Conde and Francisco Lopez are buddies and every morning they sit in the concrete steps waiting for lunch time at Little Havana Community Center. They talk politics, the Berlin wall, ect. 10/22/1981, Trish Robb/Miami Herald Staff: Maria Oses, who just opened an Argentinian bakery at 1169 Sw 8th st.
Undated: East Little Havana Rolando Valdes sits at the door of his "store", in SW 7th St. and 2 ave.
3/10/1988: (Lower) Alfues C. Gadoth; (upper) Meris Cherres, laying bricks for sidewalk Little Havana beautifications project. 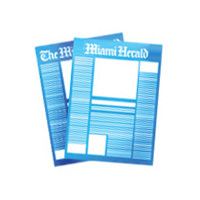 5/2/1994, Nuri Vallbona/Miami Herald Staff: Holes in the walls of illegal rooming houses in Little Havana are common as inspectors point out problems which landlords routinely ignore. 5/19/1988, Raul Rubiera/Miami Herald Staff: Antonil Brito, 78, is waiting for Domino park to open so he and his friends can have a place to go. 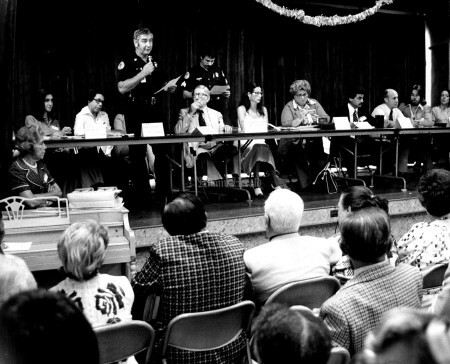 9/27/1990, Joe Rimkus Jr./Miami Herald Staff: Demonstrators fill the city comission chambers during Thursday's meeting asking to keep name of Pequeña Habana for Latin quarter. 3/13/1978, Joe Elbert/Miami Herald Staff: Feodoro Santanna shows Debbi Stone of Hialeah how to roll cigars. 11/1/1990, Raul Rubiera/Miami Herald Staff: Shotgun house built in the beginning of the century on 5th Ave just south of 8th street. 6/19/1991, Tim Chapman/Miami Herald Staff: Nicaraguan Manuel Gonzalez (left), with his niece Gema Gomez playing on the balcony of their small apartment in Little Havana. In the background is another relative, Anielka Gomez. 11/19/1982, Bob East/Miami Herald Staff: Renaming of Little Havana Community Center to Manuel Artime. 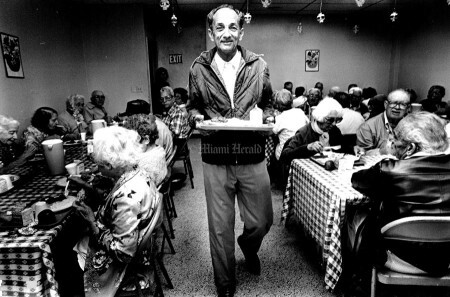 4/17/1994, Al Diaz/Miami Herald Staff: At Little Havana's La Esquina De Tejas Maria Lemus serves coffee to Thomas Marrull. The restaurant has been on the corner of Southwest 12th Avenue and First Street for more than 25 years. It opened in 1966, one of the first anchors in the growing Little Havana area. It made its way into Republican history by serving two presidents. Ronald Reagan ate roast chicken there, and George Bush drank a cafecito. In 1983, Reagan became its most famous customer when he ordered roast chicken, black beans and rice and flan.Then, the lunch cost $3.75, although Reagan wasn't charged for it. It became the Presidential Special. Today, that special costs $7.25. 7/8/1985, Miguel Fairbanks/Miami Herald Staff: Jose Manuel Otero gesticulates profusely during a talk with a friend across from him. 3/13/1978: Little Havana. Anais Molina, 2. Undated: Carnaval Miami, the largest Hispanic celebration in the United States, attracts more than 500,000 people each spring. Many of the best traditions of Latin America and the Caribbean, from spicy foods to street dances, florish to the delight of visitors and natives alike. 9/15/1990, C.M. Guerrero/Miami Herald Staff: (L - R) Sec. Of Tourism de Mexico Pedro Joaquin Caldwell and the Gov. Of Veracruz Dante Delgado, uncover the star of Agustin Lara. 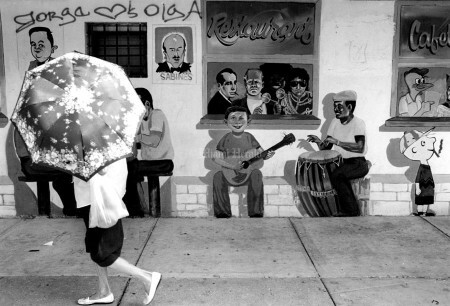 Undated, John Pineda/Miami Herald Staff: Little Havana. 3/13/1978, Miami Herald Staff: Joe Elbert/Miami Herald Staff: Dancers on Calle Ocho (girl is Marylena Benitez -- guy unknown). 7/2/1991, L.E. Baskow/Miami Herald Staff: Upside - down mannequin outside Little Havana Los Zapatos Rosa show store. Undated, Miguel Fairbanks/Miami Herald Staff: A chair with the words "Fidel will die soon, the assassin,'' may well reflect the attitude of some or the men at the corner. 12/5/1988, Raul Rubiera/Miami Herald Staff: Siria Orta leaves her rented apartment for the last time as she is head to her new Home as her granddaughter Cindy Garcia 7 watches her go. The East Little Havana Community Development Corporation opened two 57-unit condominiums Southwest First Street. Built with public and private money, the $6 million project has made homeowners of 85 low-income families. One new homeowner, Siria Orta, came to Little Havana from Cuba 22 years ago and always rented apartments. She and her husband supported themselves on his $302-a-week salary and lived in an apartment that cost them $400 a month. In their new two-bedroom condominium at Rio Plaza, their monthly mortgage payment is $313. The Ortas had a full year to pay the $2,000 downpayment. Undated, Bill Frakes/Miami Herald Staff: Mr. Romero as his dog on SW Eighth Street - Little Havana. 11/20/1987, Mary Lou Foy/Miami Herald Staff: Esther Pallais points to top where workmen are actually beginning to build the condo she will move into in the spring. 5/19/1988, Raul Rubiera/Miami Herald Staff: Jose Luis Santiago, owner of La Isla shoe store in Flagler. El Herald Marta Mirdo (Zita) - Little Havana. 5/9/1985: Hilareo Lopes at the Little Havana Activities Center. 10/7/1996: Little Havana - Dominoes at Antonio Maceo Park on SW 8th St.
7/8/1985, Miguel Fairbanks/Miami Herald Staff: For the past 20 years, this group of Cuban men have gathered in the parking lot of the American grocery store each evening as a social meeting place. 5/19/1988, Raul Rubiera/Miami Herald Staff: Eddie J. Eveld, 65 has been living in the streets of East Little Havana for the last 11 months. 6/23/1990, Donna E. Natale/Miami Herald Staff: Customer, Fausto Astudillo, bargains with volunteers Zoila Puig and Maragrita Norman over a paid of shoes at the Little Havana Center during a mini - bazaar. 6/23/1990, Donna E. Natale/Miami Herald Staff: Diego Miranda, 6 years, tries out a toy camera he picked up at the mini -bazaar while shopping with his father. 7/18/1992, Pedro Portilla/Miami Herald Staff: Heriberto Jimenez and Mery Torres of Creators Ballet, dance a typical Cuban Zapateo to the music of the Cuban Folkloric groups "Remembranzas del Comerco," at the second annual Punto Cubano Festival held on Sw 8st and 23rd Avenue in Little Havana. The event attracted some 700 to 800 people and featured dance groups from other Hispanic countries as well. Undated, Miguel Fairbanks/Miami Herald Staff: Passing around a cup of Cuban coffee for each to have a small taste is part the daily milieu. 12/6/1988, Tony Olmos/Miami Herald Staff: Picture of from of Rio Plaza Condominium Building, a low income housing unit. 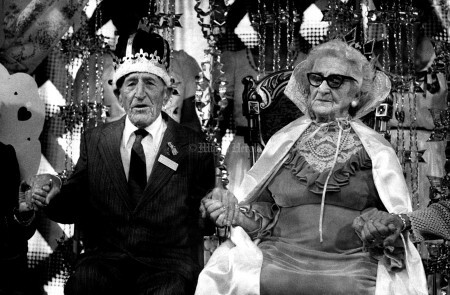 1/15/1977: Little Havana - King and queen of love Abraham Medis and Ana Ramos. 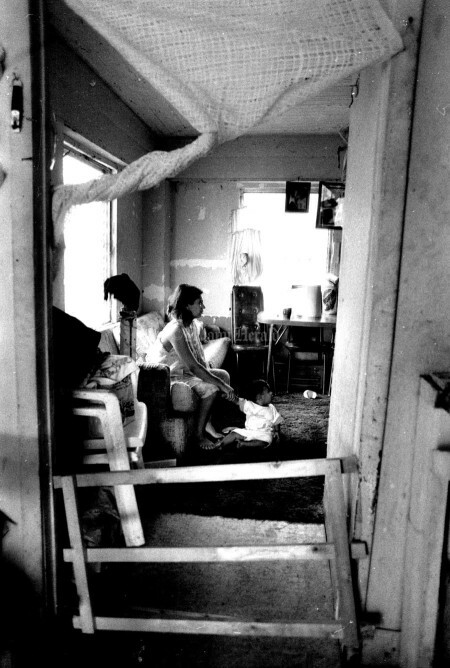 12/5/1988, Raul Rubiera/Miami Herald Staff: Maria Veronica Nataren and her 10 month old daughter Carmen live in a small room of a Little Havana Boarding house. 6/30/1983, Rick McCawley/Miami Herald Staff: Little Havana - Alberto Sardinia at home. 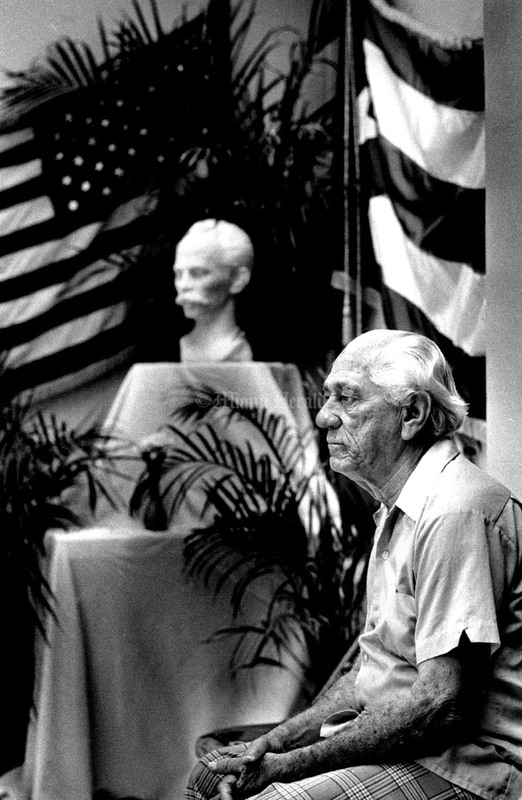 3/1/1987, Mary Lou Foy/Miami Herald Staff: 76 Yr old Sebastian Montano sits near a "Shrine'' to Jose Marti in corner of little Havana Activities Center. He is watching dancing, singing, and political speaches that preceed the daily noon lunch he receives here. 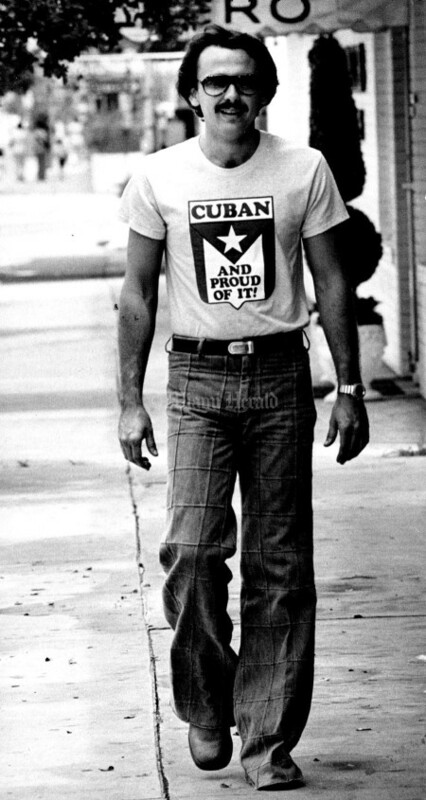 Miguel Jimenez, 26, strolls down SW 8th St. with his "Cuban and proud of it" t - shirt. 8/18/1978, Albert Coya/Miami Herald Staff: Old timers listen to police at the Little Havana Activities Centre. 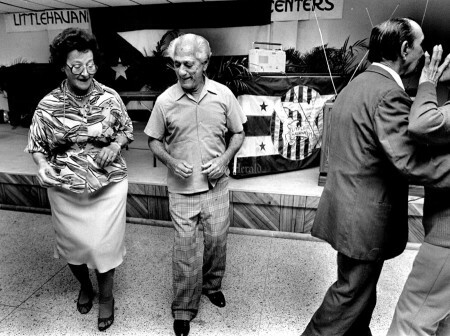 5/18/1986: Soila Reyes and Jose M. Muniz dance at the new Little Havana Activities Nutrition Center. The band is made up of center members. 5/11/1994, A. Enrique Valentin/Miami Herald Staff: A woman strolls past a mural in front of the Casblanca Restaurant on SW 8th Street. 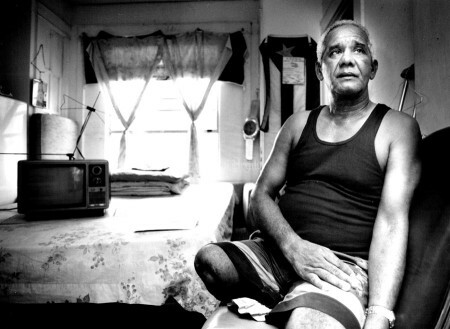 5/2/1994: Nuri Vallbona/Miami Herald Staff: Antonio Bustamante, a former Cuban political prisoner, sits in the room he rents in a house which has been divided into small apartments in Little Havana. Landlords have converted old homes in Little Havana into illegal rooming houses, Many of the rooms are in terrible condition. 1/18/1979, Albert Coya/Miami Herald Staff: Little Havana Community Center inauguration. 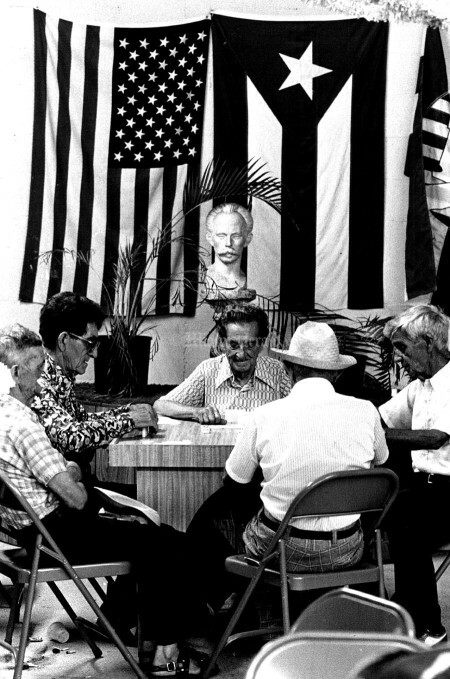 Undated: Little Havana activities center. 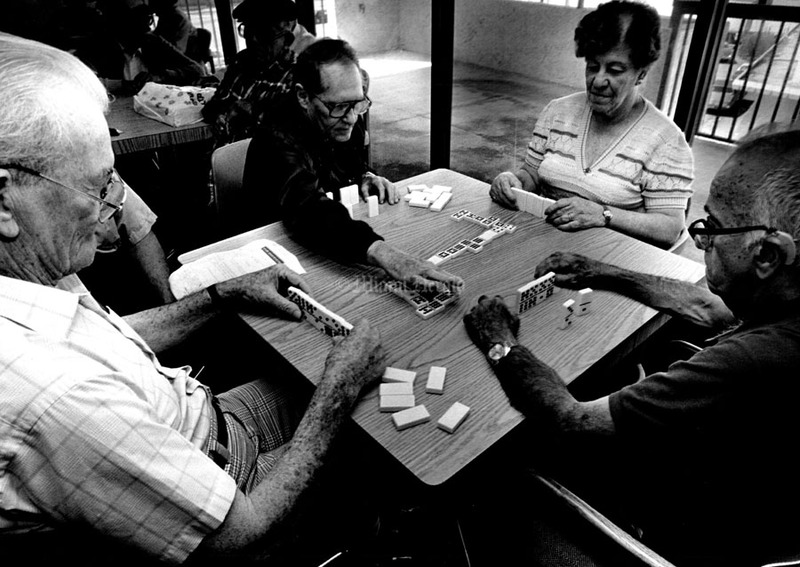 2/27/1987, Randy Bazemore/Miami Herald Staff: Some of the people at the Little Havana activities center enjoy a game of dominoes while waiting for a hot meal L to R - Vicente Hernandez 76, Gil Rosado 67, Maria Torres 67, and Manvel Garcia-Mayu 80. 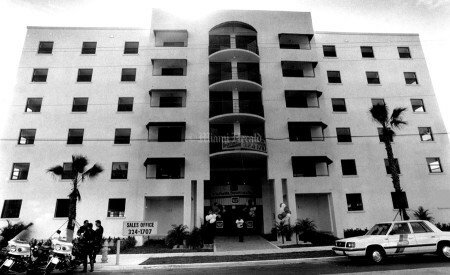 6/19/1991, Tim Chapman/Miami Herald Staff: Nine of the 11 people who live in this two bedroom apt in East Little Havana. 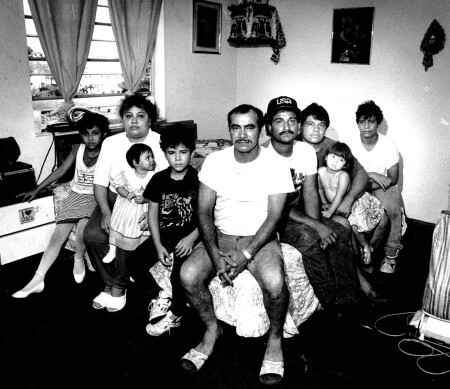 they are Nicaraguans from Managua here they sit on a bed in the living room. 3/1/1987, Mary Lou Foy/Miami Herald Staff: Pedro Morales carries his noon hot lunch to his regular table of friends. At the Little Havana Activities Center. 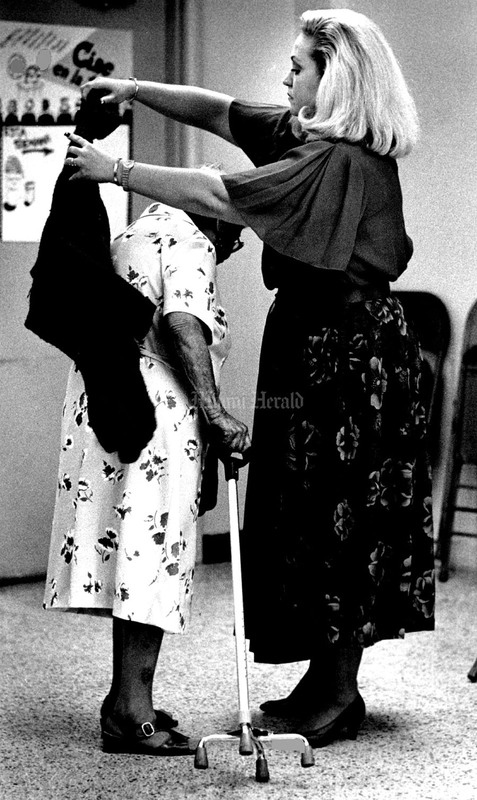 10/19/1987, Mary Lou Foy/Miami Herald Staff: Josephina Carbonell puts sweater around shoulders of Magdalene Menendez who signed up for the Little Havana Activity Center at 800 SW Seventh Ave 12 years ago. 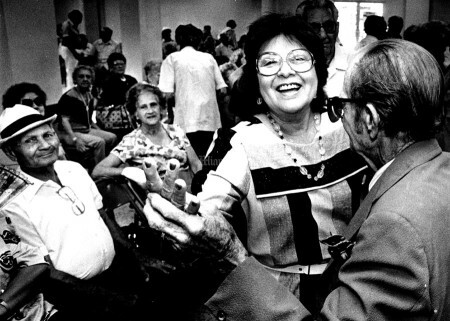 3/1/1987, Mary Lou Foy/Miami Herald Staff: Sebastian Montano, 76, dances salsa with 66 year old Zoila Rodriguez. She says he is a great dancer.